Captain Westerling had been the commander of the Special Forces (Korps Speciale Troepen) between 1946 and 1948 and had a great impact on these forces for the majority of their existence. In 1949 he had become a private citizen and started a transport company on Java. Although he had left the army he was still a man with infleunce in military circles. Somehere in 1949 he had formed a secret small private army called the APRA, in Malayan: Angketan Perang Ratu Adil or translated “Legion of the Just Ruler”. By the end of 1949 the Dutch had handed over the sovereignty to Indonesia but the situation had not yet stabilized. There was unrest and there were several revolts. Westerling with his APRA also planned and executed a failed revolt on January 23rd 1950, only a month after the independence of Indonesia. Westerling’s aim was the continuation of the independent region Pasundan on Java. In order to do this he planned to take over the cities Djokjakarta and Bandoeng. His group of around 400 men consisted mainly of former military and police forces. Among these men were around 125 active Special Forces soldiers that had deserted shortly before this planned revolt. Most of the men that participated in this illegal action were caught. The men that were still officially serving in the Netherlands East Indies Army were sentenced as deserters by the Dutch Military Authorities were interned and not handed over to the Indonesian authorities. Most went to the Netherlands after their sentence. Those APRA men that fell in the hands of the Indonesian Authorities were senteced for the participation in a revolt against the state and would have a very different fate with long prison sentences. 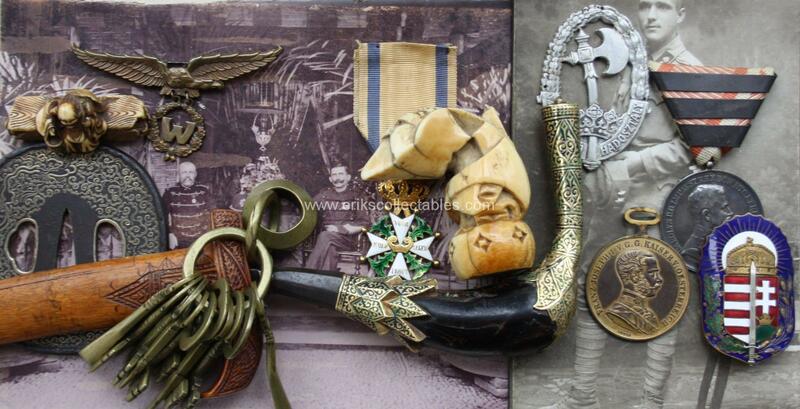 From the estate of Sergeant Major Intructor Hans Kloër came a group of wings. These were taken in 1950 from indigenous men of the Special Forces and should have been destroyed the story goes in the family. A small amount of them seem indeed to have been deliberately broken/clipped, roughly in the same location so probably using the same method or tool. Why would these wings have been deliberately destroyed? The badge was still in use in 1950 and would remain so untill 1954 in the Dutch army for those that had been qualified. Normally the army does not destroy property that can be re-used! My hypothesis is that there is a link with the APRA revolt in 1950. Were these wings from some of the 125 men Speciale Troepen that participated in this action? During the action all sorts of uniforms can be seen but none of the men wear a red beret with the wing or any other insignia linking them to the Special Forces. The breaking of this wing is a very strong symbolic action. Had the APRA men done this themselves before deserting? Has the army done so after they were taken into custody and sentenced as deserters? Maybe we will never know but working from the APRA link hypothesis I will continue to research! Museum Bronbeek, inventarisnummer: 2007/06/04-3/1 – all period photo’s are from this album in the museum collection. Recently I was able to acquire a small collection of badges and wings from the Netherlands East Indies Army (KNIL) from the 1940s. Both of these models of wings were introduced in 1940. At that moment there was still peace in the Dutch East Indies but the war in the Netherlands already was lost. Wings were still produced locally. This changed after the Indies were lost to the Japanese in 1942. All forces and planes evacuated to Australia as far as possible. Troops left behind ended up as Prisoners of War with the Japanese invaders. During the war the operations in the pacific were continued from Australia. The education of new pilots and aviation crews for the Dutch East Indies Army was mostly done in the USA. This had as a result that wings were produced in both the USA and Australia. In the USA one maker was used, Amico. In Australia two makers were used KG Luke and Stokes. All makers have slight differences in the feathers of the wings Colour is the easiest distinction between the USA and Australian versions. Amico used the dark bronze colour that was also the standard before the war. In Australia the colour (and material?) was brass. Most wings produced after 1941 are also marked by the maker but not all. Both of these wings are made by Stokes but are from different batches. One is a rare variation with the pre-war style closure in place of the regular pin with safety closure. According to Rob Vis (the foremost Dutch Wing Collector) in 1942 when the KNIL had to evacuate to Australia a rush order was placed for some types of wings and these were ordered with the old (then standard) style closure. Later production batches all had the regular pin backs. The bomber is an even rarer variation as post 1945 these were no longer produced. The bombers were used as strafers in Indonesia so bomb aimers were no longer trained. Below an example of an Aviator combined with Navigator (W for Waarnemer) wing made by Amico in the USA. Note the different style of wing/feathers and the darker colour despite being polished to shine in the past.. (This wing not part of the recent additions). According to Mr. Vis reproductions of the Stokes early batch type of wing also exist but are of lower quality. As all of the ML KNIL wings are relatively rare reproductions have been made to fool collectors so please study before buying! A great overview of all ML KNIL wings can be found here.